WASHINGTON — The Supreme Court on Wednesday upheld a judgment allowing families of victims of Iranian-sponsored terrorism to collect nearly $2 billion. The court on Wednesday ruled 6-2 in favor of relatives of the 241 Marines who died in a 1983 terrorist attack in Beirut and victims of other attacks that courts have linked to Iran. Justice Ruth Bader Ginsburg wrote the opinion for the court rejecting efforts by Iran’s central bank to try to stave off court orders that would allow the relatives to be paid for their losses. Iran’s Bank Markazi complained that Congress was intruding into the business of federal courts when it passed a 2012 law that specifically directs that the banks’ assets in the United States be turned over to the families. 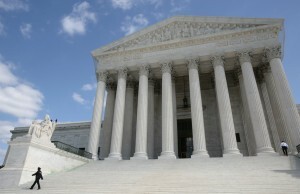 Chief Justice John Roberts and Justice Sonia Sotomayor dissented. “The authority of the political branches is sufficient; they have no need to seize ours,” Roberts wrote. More than 1,300 people are among the relatives of the victims of the Marine barracks bombing in Beirut, the 1996 terrorist bombing of the Khobar Towers in Saudi Arabia which killed 19 service members, and other attacks that were carried out by groups with links to Iran. The lead plaintiff is Deborah Peterson, whose brother, Lance Cpl. James C. Knipple, was killed in Beirut. Congress has repeatedly changed the law in the past 20 years to make it easier for victims to sue over state-sponsored terrorism; federal courts have ruled for the victims. But Iran has refused to comply with the judgments, leading lawyers to hunt for Iranian assets in the United States. Liberal Democrats and conservative Republicans in Congress, as well as the Obama administration, supported the families in the case. The case is Bank Markazi v. Peterson, 14-770.